Chair design at Cranbrook has always had its own special niche and fascination among artists and patrons alike. George Booth altered chair designs for his own use at Cranbrook House. Eliel Saarinen designed unique chairs for Cranbrook School and Saarinen House. 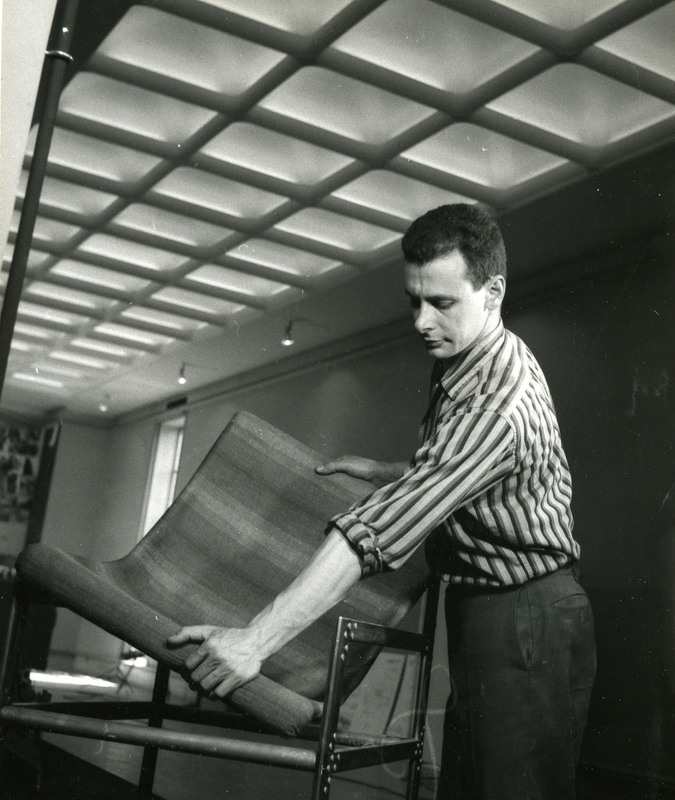 Ralph Rapson conceived of his chair design for what became known as the Rapson Rocker while a student here. Most of us are familiar with the famous chair designers, but what about projects by less famous designers? During the war years, Academy of Art students were encouraged to experiment with modern design and new and unusual materials. In 1944, Academy students Gloria Bucerzan and Jean Roberts designed and constructed a chair born of war shortages, by eliminating the use of springs and creating webbing using “non-critical” materials. 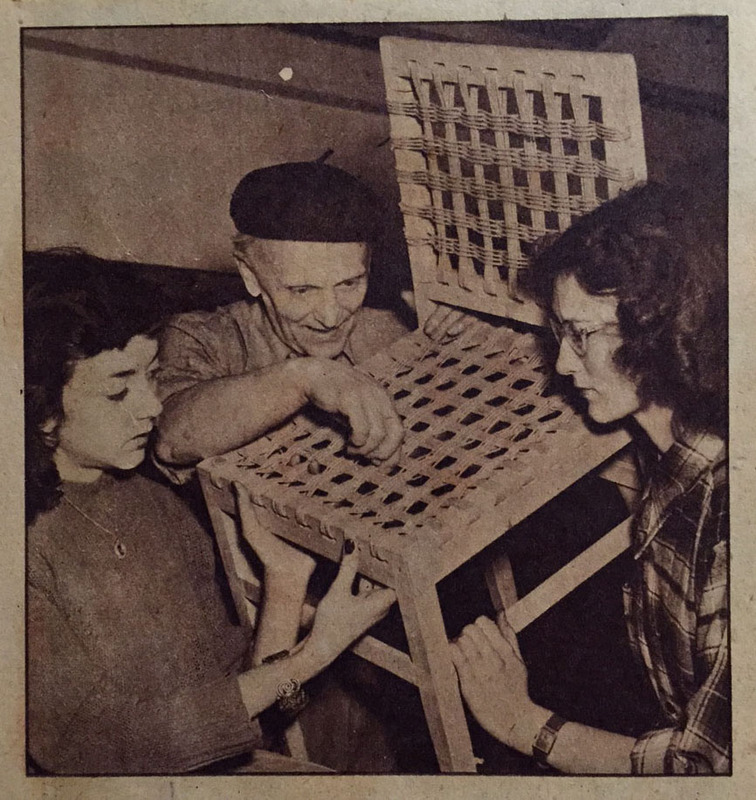 Gloria (left) and Jean with woodworking instructor Svend Steen, 1944. Copyright Cranbrook Archives. Unknown student setting up work for Student Show, 1958. Copyright Cranbrook Archives. 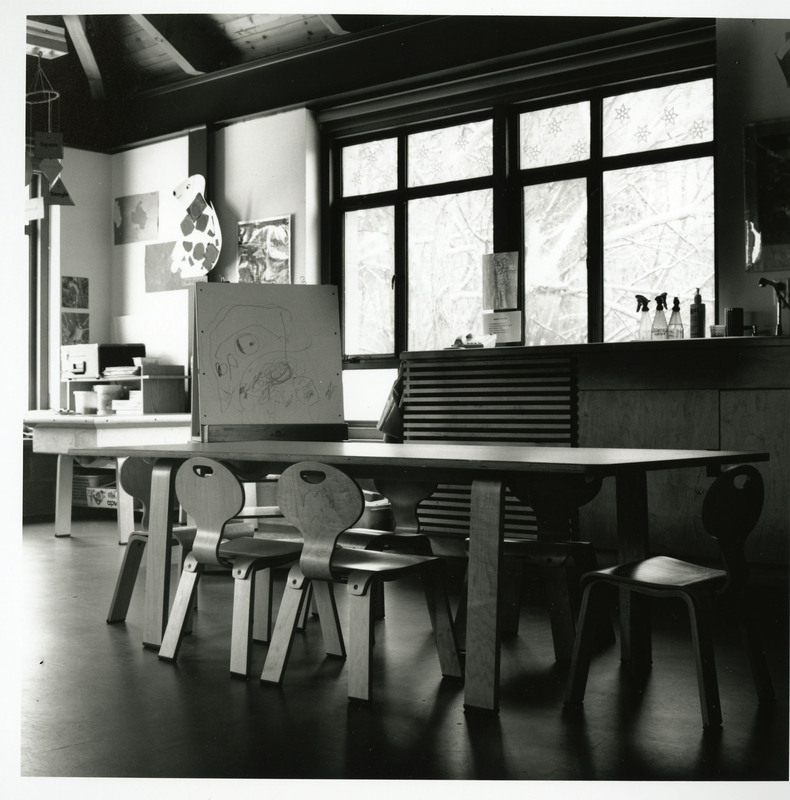 Art Room, Early Childhood Center at Brookside School, 1997. Chairs designed by Dan Hoffman, Cranbrook Architecture Office. Photograph copyright Christina Capetillo. For more on chair design in general, check out the 2012 Year of No-Chair-Design and the Guide to Great Chair Design which features links to chair blogs, the history of chair design, museums, galleries, and books that all feature what else? Chairs! Photo Friday: Plans Set Sail! As the new Collections Fellow for the Cranbrook Center for Collections and Research, I was charged with coming up with a theme and writing today’s Photo Friday blog, a daunting task as it is only my first week. Lucky for me, a few of our archivists were working in our reading room pulling documents and photographs for a display this weekend for Cranbrook Art Museum’s PNC Bank Family Day and a few of them jumped out at me. In 1928 James Scripps Booth, eldest son of Cranbrook’s founders George and Ellen Booth, designed a plan for a boat called the Alura II. 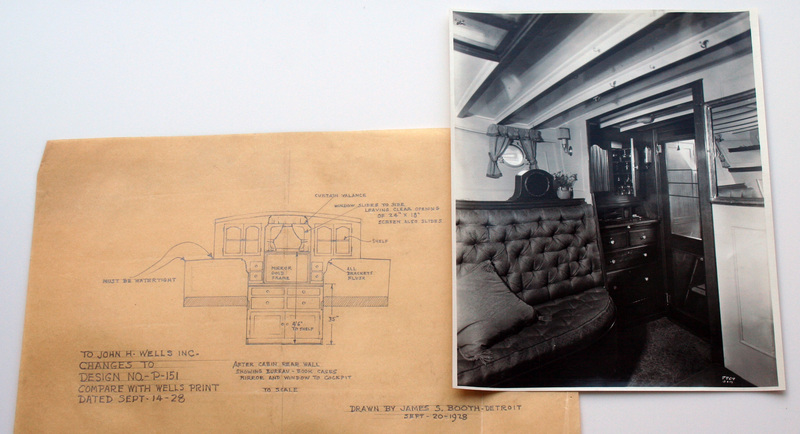 Today’s photo includes a Booth’s original design for the bureau-book cases, mirror and window to the cockpit and a photograph of the “screened door companion-way from enclosed bridge area.” Although some of the plans were changed during manufacture, you can see the resemblance to Booth’s original design especially in the drawers and shape of the window shape. The Alura II was a fifty four foot long motor cruiser, with two 275 horsepower engines, so it could go as fast as 16 mph on the water! The boat included electric lights and toilet facilities, a four burner gas stove, and a gas water heater, as well as a Fridgeair ice box. The Alura II was completed in 1929. James and his wife Jean cruised in the boat for most of the summer that year, closing their home to take to the water. Today’s photo is a sneak peak at some objects you can see on display in the Cranbrook Archives during PNC Bank Family Day this coming Sunday September 28th from 11am to 5pm. Many documents and photographs like today’s Photo Friday will be available to view and learn more about Cranbrook, the Booths, and boats! Learn more about the day’s nautical themed activities, tours, and lecture on the Cranbrook Art Museum’s website. For the past nine months I have been working on a project to breathe new life into an oral history initiative at Cranbrook that began as early as 1964 as a collaborative project between Cranbrook School and the Cranbrook Foundation. These oral histories give us an intimate view of life here at Cranbrook over the past half century with interviewees spanning across the entire community. They range from Dr. Lee Dice at the Institute of Science, to Cranbrook Academy of Art painter Zoltan Sepheshy, as well as interviews with members of the Vettraino family, whose time living on the grounds spanned several generations. These interviews give us the kind of glimpse into the past of Cranbrook that is difficult to find anywhere else. Cranbrook’s oral histories are found in the archives in analogue sound formats, namely on magnetic tapes. In order to preserve these interviews and provide access to a wider audience, the Archives is implementing a plan to digitize all of the content. Each oral history is digitized in real time and then transcribed, with each hour of audio taking anywhere from 8 to 10 hours to transcribe, depending on sound quality. One of the latest gems to be uncovered is a recording of a conversation with brother and sister James and Doris Smith who worked as model makers and production designers from the mid-1940s for many of the artists and architects associated with Cranbrook. James began working with the firm of Saarinen, Swanson, and Saarinen in 1943, while Doris joined them in 1946. Both had their hands on many of the largest projects, such as creating the models for the General Motors Technical Center, and their insight into the daily work and life in the office is unmatched and cannot be forgotten. In the following clip you can listen to James Smith discuss events and the atmosphere that surrounded the winning entry from Eero Saarinen & Associates for the Gateway Arch in the Jefferson National Expansion Memorial in St. Louis, Missouri–better known as the St. Louis Arch. Construction of TWA model at Eero Saarinen & Associates taken by Claude de Forest, 1957.Cranbrook Archives.